K-9 Chief on the Beat! Bring the family out for a new fun event! 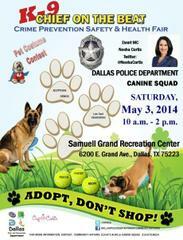 Saturday, May 3, 2014 at Samuell Grand Recreation Center! Adopt, don't shop! !